First: two WONDERFUL pieces of news yesterday! 2. More friends, Billy and Nicholle, got engaged yesterday in New York Cityyyyyyy! Billy did a great job with the proposal. I saw the secret photos he had taken of it and everything today, maybe they'll let me showcase a few of them, they're so cute! So excited for them! More of yesterday, went to a Turbo Kick class with Erin last night. She's a member at the RAC and this class (thank God) was just for women. I tagged along to try it out so I didn't have to run in the frigid cold of Rochester yesterday. After it was over my hamstrings and shoulders, alright, and everything else, were telling me rather loudly that maybe I should have just gone for a run. Losing toes to frostbite might be a positive alternative to what my muscles are feeling this morning. 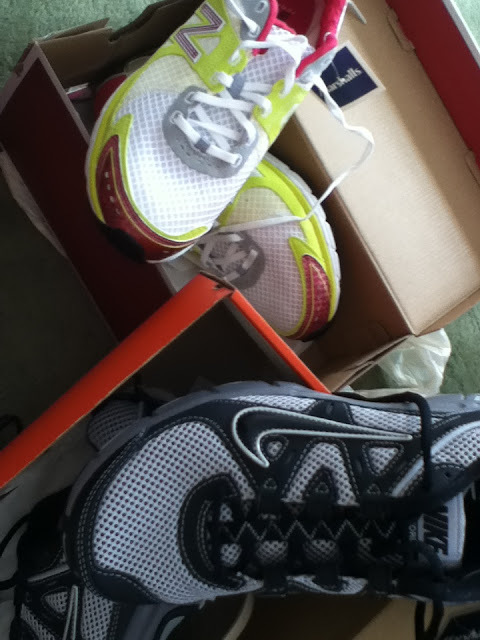 Upside is that I bought new running shoes to try out on my sore legs tomorrow. ...Or maybe the day after. I sure didn't waste any time to get shopping once Chris was on a plane out of New York. On that note, yesterday was Chris' 25 birthday!!!! If you are a friend of his and read this blog (two highly unlikely mutual things) AND are also heading to California (honestly, I know that isn't any of you but I'm reaching here), make sure you give him a birthday hug or two. Spankings are also appropriate. Wait, no. They're not. Maybe a birthday handshake or high-five will do. Family birthday pictures to come!